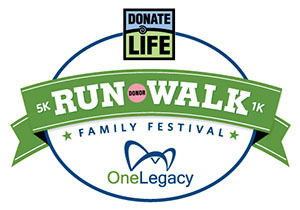 Thank you for visiting my personal page and helping me to support the Donate Life Run/Walk benefitting the OneLegacy Foundation! OneLegacy Foundation is a 501(c)3 non-profit organization, Tax ID #45-2936915. Donations are tax-deductible to the maximum extent allowed by law. OneLegacy's mission is to save and heal lives by inspiring and advancing donation and transplantation of organs and tissues through research, public education, and honoring donors whose legacies live on. 116,000 men, women, and children await lifesaving organ transplants. people die each day waiting for an organ.